It is a great question, primarily because it is seldom asked as everyone takes the popularity for granted, as if Indians were born cricket lovers! Once asked, we scratch our heads for answers. Globally, the poor prefer to play soccer (football), whether Latin America or Africa. The only cost to soccer is an inflated ball, and nothing else. Cricket is slightly more “expensive” as it requires a bat PLUS ball. In India, it was a preserve of the rich and upper classes, those who could afford the gear, had access to the Gymkhanas and the leisure time. 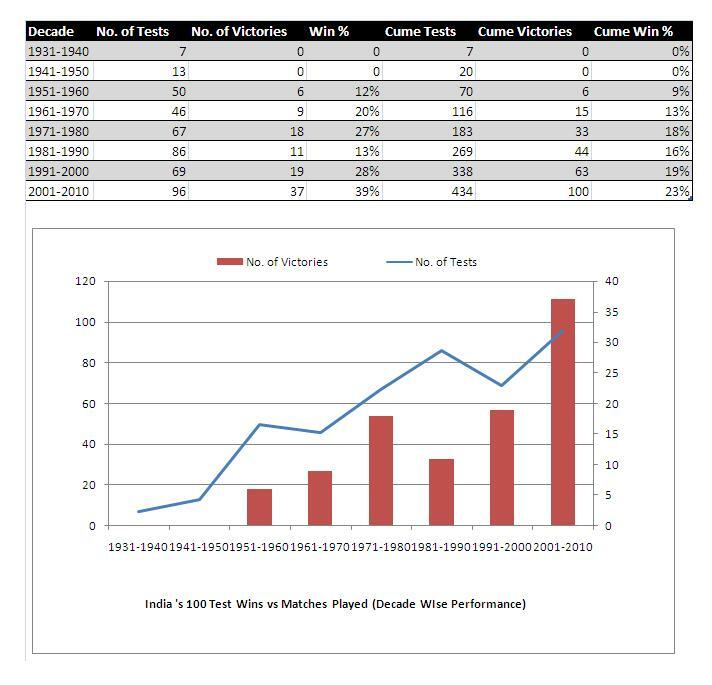 Check the profiles of Indian Test teams till the 80s. An elitist game, it has “Laws” not “Rules”! The Laws in relation to other global sports are one of the world’s most intriguing and confusing for the layman. Cricket should never have succeeded in India considering that the nation’s socio-economic odds and history are stacked steeply against it, while they are hugely in favour of Soccer (Football). YET, it is the no. 1 sport in India, with players now coming from the poorest of the poor, “gulley” cricketers, tribal areas, rural areas and so on. The “craze” began from the post Kapil Dev era and the rise of colour TV after 1982. As luck would have it, India won the World Cup in 1983, led by a Captain who’s profile was the exact opposite of the traditional cricketer: rural, rustic, Hindi speaking, poor, no access to any club, but a player with a huge heart and a never say die spirit. In 2 years, India won the Kerry Packer/Channel Nine produced World Championships in 1985, which was televised “live”. The public watched in amazement at cricketers wearing colored clothing, playing at night under floodlights! It was the beginning of cricket as entertainment. And yes, the country losing at every sport, were World Champs in a globally recognized and televised sport, proving their 1983 win wasn’t a fluke. But even this isn’t the reason for the sport being so popular. The answer to that is so basic and so obvious that you feel frustrated for not having thought of it in the first place. The answer to that is known subconsciously to every single child playing cricket in the by-lanes (“gully”) or a slum or a public ground (known as “maidan”). A country where kids are denied an opportunity at almost every level, where kids beg for a “chance” at anything, cricket was the ONLY group sport where EVERY kid got a chance to bat and show the other kids what he is capable of.Whatever the team composition, whether 3 or 5 or 11 or even 20 players a team, every kid got his turn to bat until they got out. In soccer, not every kid got his chance to “score a goal”. Sometimes they don’t get a chance to even kick the ball.The weak players were put in defense or asked to “guard the goal area”.Tell that to your 10 year old kid! But in cricket, everyone got a chance to hit that glorious “4” or massive “6”. And everyone has hit that one glorious shot in a neighborhood game which is etched forever in his memory, and it probably plays on his mind every time he watches his favorite cricketer hit a boundary. As India expands its economy, and more kids get opportunities denied to earlier generations, you find kids slowly venturing into other sports and winning: boxing, shooting, running, tennis, badminton. So the cricket “craze” will fade a bit in urban areas as India grows richer. But in poor, rural areas, it will remain the no.1 sport and that is where the majority of Indian “stars” today come from. Who is the Fake IPL Player? Its Anupam Mukerji. The Identity of the Fake IPL Player has finally been revealed. Anupam Mukerji revealed his identity on the Times Now news channel today. As predicted, he turned out to be a nobody with plenty of free time. The mystery author of the Fake IPL Player blog is not a cricketer. My guess is that he isn’t even present in South Africa. He is most likely an intelligent journalist but could easily be a recently “pink-slipped” IT chap with loads of free time sitting in the US. This isn’t a money-making blog as there are no Google Ads on the blog though it takes just 2 minutes to start Google Ads on Blogger. If he isn’t in South Africa, then how does he get his “information”? He either makes up the story using already published news articles or probably through a “source” who could be one of hundreds of small time journalists covering the IPL in South Africa. These journalists travel from city to city , cover many teams and have lots of access to information most of which is hardly “secret” info and available to thousands of cricket fans. The content in the blog posts (especially the dressing room stuff) is pure conjecture & guesswork built on easily available info anyways. Any cricket fan in India who saw the pre-IPL press conference with Buchanan and Ganguly, can see that former Indian captain is irritated by Buchanan. Anyone who saw KKR matches can find out that there is no unity in the team. Very similar to the Indian National team under Greg Chappell during the world cup in West Indies!!! If the Fake IPL Player is indeed a journalist, then it is highly probable that the journalist is a Bengali (and belongs to a Calcutta based Bengali or English newspaper) and most likely he is pretty pissed at Ganguly being insulted & snubbed by Buchanan and SRK by removing him as captain. I would be furious too, as Ganguly is India’s most successful captain in history and has the respect of almost entire cricketing fraternity in India. And the lesser said about John Buchanan the better. Just ask Shane Warne about Buchanan. McCullum hasn’t even captained a provincial New Zealand squad, leave alone international teams. Almost nobody in India likes John Buchanan I guess. If SRK has even half a cricketing brain he would immediately make Ganguly not only the sole Captain but also the Coach of Knight Riders (like Shane Warne for Rajasthan Royals). Of course the content of the blog isn’t of the same quality as compared to the Fake Steve Jobs blog written by a Forbes journalist, but in its own way its pretty entertaining and completely harmless if the reader’s understand it is pure fiction. The recent ICC rankings of the “greatest” cricketers of all time was so atrocious that it defies logic. The less said and written about it the better. Better rankings have been provided by Wisden and most recently by even Shane Warne. Here is my list of the Top 10 Batsmen and Bowlers of all time. But please note that this is not a “ranking” as different statistical models have different rankings…with the exception of the legendary Sir Don Bradman who is unanimously rated as the best. So this list shows the greatest “10” in any order you like and is not a “rank”.